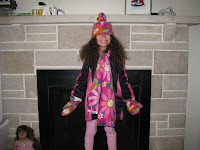 SquigglyTwigs Designs: Winter Coat and Accessories....Done! Well here she is. And, behind the gray dot, she has a very big smile on her face. It took a while, but wasn't as hard as I thought it could be. The mittens were actually harder than the coat. The first sets were too small. Maybe we'll find a baby who can use them. he he. 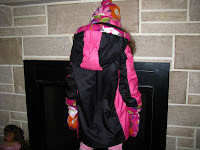 The hood is trimed with fleece, and there are pink pieces set into the front and back sides, top of sleeve, and middle of hood. This is the photo with her hat, ball on top and all (her idea). Gathered pocket idea, taken from an Ottobre pattern and enlarged to a coat size. 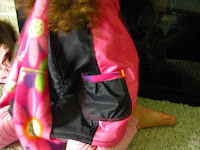 She has a pocket on each side of the front. They are lined and trimed in fleece. Curly was certain that her brother (aka Handsome Dude) needed some fleece for winter also. She wanted me to make him a coat, actually. However, since he gets great hand me downs from friends and cousins, I made a deal for a hat mittens, and scarf. Curly chose the fleece she thought he'd like. It has race cars and flags on it. The mittens have three layers: top fleece, middle rip stop nylon to keep them dry, and inside flannel. Next time I'll make several pairs to change when they are wet and leave out the rip stop nylon...it's quite restrictive...no stretch. Thanks for looking and praying. This was lots of fun. You did a fantastic job on the coat! Love the coat and all the accesories. You're a wonderful seamstress. 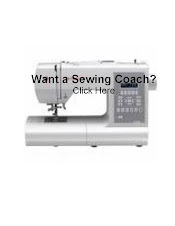 Can't wait to get started on our sewing get togethers. We need to start soon cuz I wanna make a Christmas Dress.